Friday April 19th marks the three-year anniversary of the passing of Guru and this track, “G.U.R.U.” f/ Talib Kweli & DJ Premier is dedicated to his memory and a celebration of his life, legacy and all of the vast accomplishments and great music he and DJ Premier gave us. 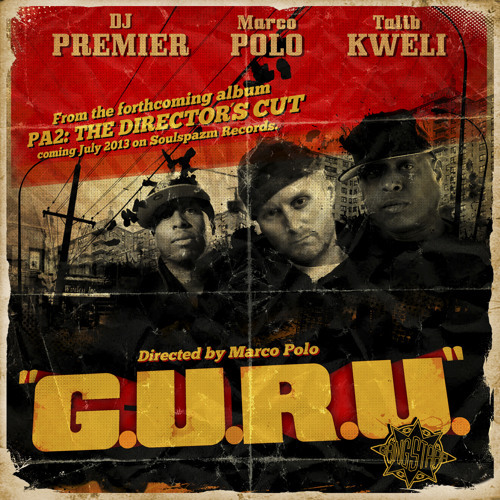 “G.U.R.U.” also serves as the lead-single from Marco Polo’s forthcoming LP, PA2: The Director’s Cut, which will be released in July 2013 on SoulSpazm Records. Marco Polo’s PA2: The Director’s Cut features appearances from Organized Konfusion, Gangrene, Talib Kweli, DJ Premier, Masta Ace, Posdnuos (De La Soul), Kardinal Offishal, Styles P, Nature, Rah Digga, Slaine, Celph Titled, Ill Bill, Large Professor, Inspectah Deck, O.C. & many many more.